I'll admit that I forgot how odd Kato's wording is as well, though adding in the "numbered maker" phrase as well as granting Dashi a (limited) turn makes it that much more complex and odd. Beyond that, I'm not a fan of creating a 3 unique Hero turn with this guy (even if he has to remain unengaged). I think we're packing an awful lot into this single power--and then adding in two more powers (albeit recognizable ones). Sure the Ninja seem underpowered in some cases, but this guy packs a lot into a fairly small price (relative to Ulgy, Kato, and similar units). I forget why I included the "number OM" but know I can't see why it is needed and can be removed. As for the 3 unique hero turn it is really a 2 figure turn and a movement for him. Also, remember that his pool of possible figures is limited and the most expensive ones (Moriko, Shiori, and Kumiko) are poorly rated and not often if ever drafted figures. Like some of my fellow judges I am a little leery of a common squad with a possible attack of 5 (bonding heroes will be sad when facing them) and effectively a Fly speed of 8, but the Buccaneers do look like a lot of fun and I am looking forward to giving them a whirl. Super Bogue's Buccaneers of the Endless Sea have received 6 YES votes to review (1Mmirg, Dad_Scaper, Lamaclown, nyys, qt.bangerang, ZBeeblebrox) and move on in the process. I vote NO to review dok's Zog. I vote YES to review qt.bangerang's Dashi Tokainto. I have updated the wording on Dashi Tokainto's Dishonorable Leadership and would like this to be that card that is used...if we need to revote Killo that is fine. I feel that it is clearer and flows much better without the "number OM" phrase. Thanks again 1Mmirg. Dashi Tokainto by qt.bangerang has received 4 YES votes to review (Dad_Scaper, Killometer, nyys, ZBeeblebrox) and moves on in the process. Thanks for reworking Dashi, qt. b, that really does make a difference. I look forward to giving that figure a chance to get out of my "maybe someday" drawer and onto the battlefield. The Soldiers of Valhalla program is looking to expand its membership. Anyone interested in serving as a judge, please PM ZBeeblebrox with (A) a short paragraph describing why you feel you would make an excellent SoV Judge and (B) 1-2 written reviews--including votes--on current units in review for the Soldiers of Valhalla (not including Tyrian). Please send your PM by January 30th. We are excited by what we have received and would like to see at least a few more solid applications submitted. There is possible room for multiple judges to be accepted into the SoV. SoV judges are *always* peaking, Mmirg. Well this has taken me a long time to nail down. At first, I was very unimpressed with Tyrian. I just felt like he was another Syvarris with wings, but was less useful that the original Elf. So I relayed my concerns to my fellow judges. The feedback I received from my compatriots was that I was playing Tyrian wrong and allowed my first impression to cloud my judgment on how he should be played. So it was back to the drawing board, and I decided to re-play all the tests I had done with him to make comparisons. And what I found was, this figure is a Sniping shark that is fun to play if played correctly. Instead of using as a sniping cleanup hitter, which was boring, you play him first…flying up to get the highest ground as quickly as possible and firing at important targets. Sometimes he goes down quickly other times he does his job well and takes down a important piece of your opponent’s army. In one game, versus the Knights, I flew a tandem of Tyrian and Zelrig. Zelrig bombed the Knights and when he got locked down, I used Tyrian to snipe Sir Gilbert and Thorgrim, before the Knights could do anything about it. I lost Zelrig tin the process, but I make a big hole into the Knight Army by taking down their Heroes. Then my Deathknights move in for the mop up duty…a fun game, and the first time I realized exactly what we have in Tyrian…a sniping Shark that loves to take down the Big Guns. The points are fine, and he was balanced in my games. 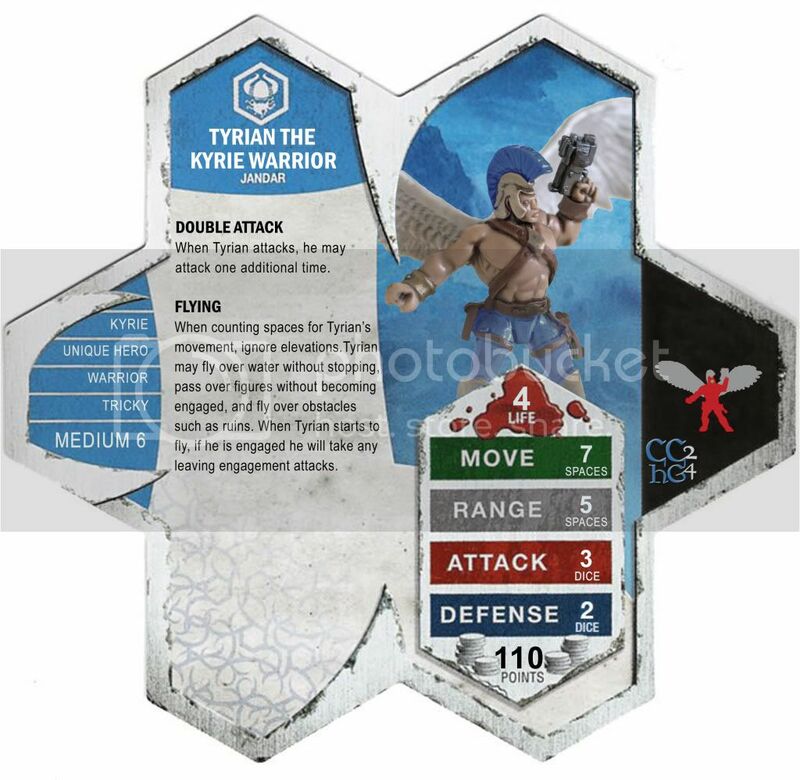 After much deliberation, Tyrian does add something new to the game and is a lot of fun; plus he is fashioned after a character in the Classic Heroscape lore. At first I was unsure about having to use another Heroscape figure for Tyrian, but as proven with Samuel Brown…you just have to make him distinguishable from the other Protectors and then its all good. So Yes, this figure can be found, you can even find another Atlaga if you want and mark him differently, since heroes are sometimes cheaper and easier to find than squads. So it is my pleasure to give my vote of YES for inducting Tyrian the Kyrie Warrior into the Soldiers of Valhalla. Tyrian the Kyrie Warrior by Paronychodon has received 6 YES votes to induct (1Mmirg, Dad_Scaper, Lamaclown, nyys, qt.bangerang, ZBeeblebrox) and moved on to the Unified Fanscape Review.